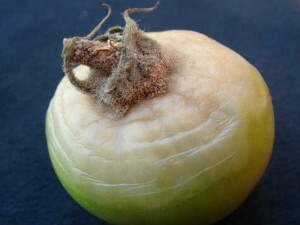 Botrytis gray mold is an economically important high tunnel and greenhouse disease that infects over 200 different host crops. 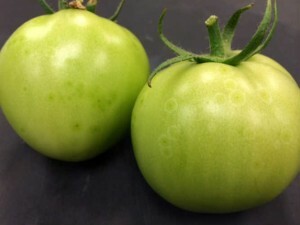 Botrytis gray mold is not only a problem in high tunnels and greenhouse settings, but can also occur during storage, transportation, and marketing of vegetables and fruits. 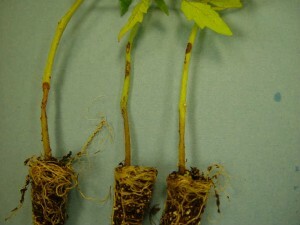 This pathogen grows very quickly and infects all above ground plant parts, where the most characteristic sign is the fuzzy, gray-brown mold. 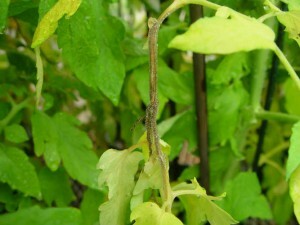 As the disease progresses, rapid wilting and plant death occur. 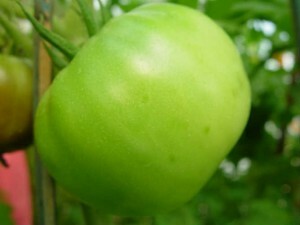 The best control of this disease is good cultural management through sanitation, scouting, and control of humidity and moisture in high tunnels. 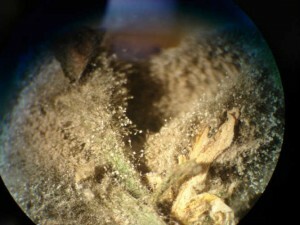 Pictures depicting the symptoms on the stems of tomato plants (top left) and seedlings (top middle); conidiophores under a microscope (top right); an infected tomato fruit with fuzzy growth (bottom left); and tomato fruits with ghost spots (bottom middle and right).